Licorice eyebrows and candy corn stand in for Dracula's eyes and fangs in these creamy, easy-to-make Halloween dessert cups. Crush 8 of the cookies; set aside. Stir boiling water into dry gelatin mix in large bowl at least 2 min. until gelatin is completely dissolved. Add enough ice to cold water to measure 1 cup. Add to gelatin; stir until slightly thickened (consistency of unbeaten egg whites). Remove any unmelted ice. Add whipped topping; stir with wire whisk until well blended. Add food colorings; mix well. Refrigerate 20 min. or until mixture is very thick and will mound. Spoon 1/4 cup of the gelatin mixture into each plastic cup. Top each with 1 Tbsp. of the crushed cookies; cover with 1/4 cup of the gelatin mixture. Refrigerate 2 hours or until set. Spread tops of the remaining cookies with decorating icing. Decorate each to resemble Dracula's face using licorice pieces for the mouth, nose and eyebrows, candy corn for the fangs and cinnamon candies for the eyes. Insert a pop stick into side of each decorated cookie. Insert 1 into each dessert just before serving. 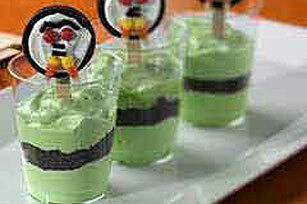 Have fun with your kids making these spooky Halloween treats. As a bonus, this can be a way to help teach them about portion control. For a spooky "blood" effect on cups, stir a few drops of red food coloring into 1/4 cup honey until desired color. Drip small amounts of "blood" down inside edge of each cup just before serving.